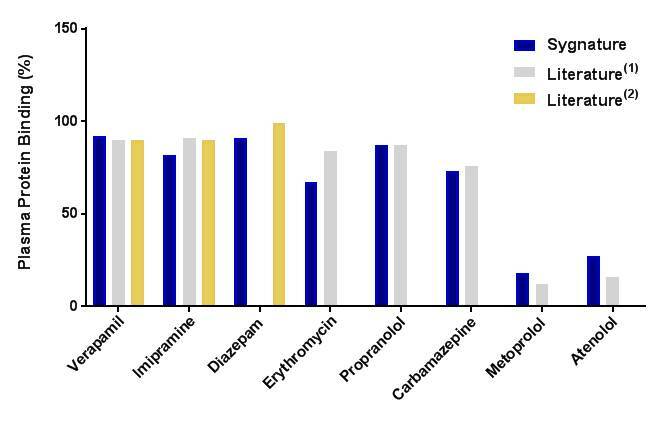 Drugs may bind to a wide variety of plasma proteins, including albumin, and the degree of binding can impact on the pharmacokinetics and pharmacodynamics parameters of a drug, given that only the free drug in plasma is available to elicit a pharmacological effect and only free drug is available to be cleared. Hence it is important to measure plasma protein binding during the drug discovery phase. The leading approach for assessing plasma protein binding is rapid equilibrium dialysis as the impact of non-specific binding is minimised when compared to other methods such as ultrafiltration and HT-Dialysis, which are relatively slow processes to reach equilibrium. Sygnature’s Plasma Protein Binding assay utilises the Rapid Equilibrium Dialysis (RED) device to measure the percentage binding of a test compound to plasma proteins in a variety of species (e.g. human, rat, dog, mouse, monkey). This will then allow the percentage unbound to be calculated. Test compounds and positive controls (species dependent) are incubated in 100% plasma and dialysed against buffer in a RED device for 4 hours at 37°C in a 5% CO2 incubator, with continuous shaking at 200 rpm. Samples are matrix matched and analysed by LC-MS/MS against a 6 point standard curve prepared with 100 % plasma. Figure 1 Graph showing the percentage of plasma protein binding using 100% plasma, and their comparison to literature values (1) Obach, 1999, DMD 27:1350 and (2) RxList. The DMPK & Physical Sciences department at Sygnature Discovery is dedicated to understanding and optimising the absorption, distribution, metabolism and excretion of drug candidates by working in close partnership with clients and other departments within Sygnature to provide successful optimisation strategies. We have extensive know-how and expertise to provide well validated, state-of-the-art assays and a comprehensive applied consultancy service for interpretation of the in vitro ADME and in vivo PK data. Our corporate vision is to accelerate the discovery of new medicines, from the laboratory into development to treat patients. Our DMPK mission is to deliver tailored DMPK expertise through innovation, quality and commitment.